The awards in all categories were announced during an evening of cabaret entertainment and a genuinely delicious three-course meal of a goat's cheese tartlet, chicken supreme and a trio of three (yes three) desserts (I'm not a food blogger, OK?). Sadly, and bitterly, some might even say disgracefully, Lexicolatry did not win either of its categories: Art & Culture went to The Irish Aesthete and Humour was a tie between At the Clothesline and With All the Finesse of a Badger. To be truthful, I'm still hurting from this, and therefore I would implore that no Lexicolatry faithful visit any of their blogs: not The Irish Aesthete's sickeningly classy examination of Irish decorative arts, nor At the Clotheline's pithy observations and recollections on life, and definitely not the quirky original artwork of With All the Finesse of a Badger. No. Don't do it. I absolutely forbid that any reader click on any of these links. 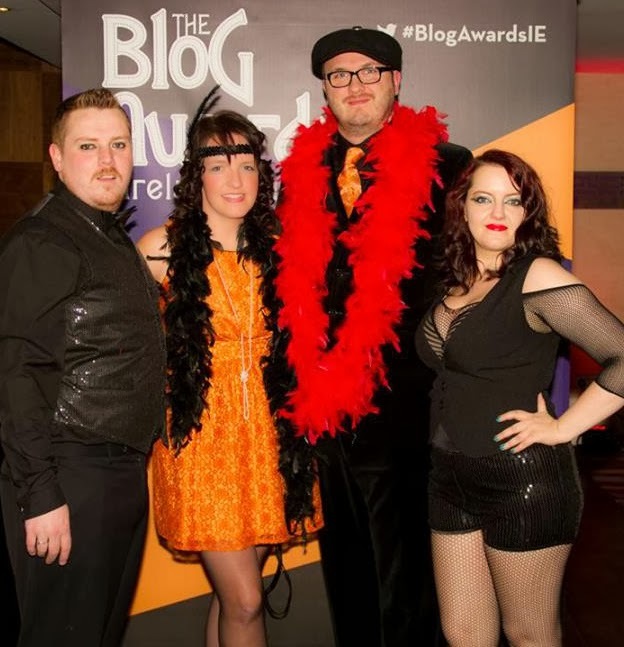 As if this wasn't humiliating enough, my wife then had the audacity to come 2nd in the Best Dressed in the Cabaret Theme competition. Please! How rude is that? 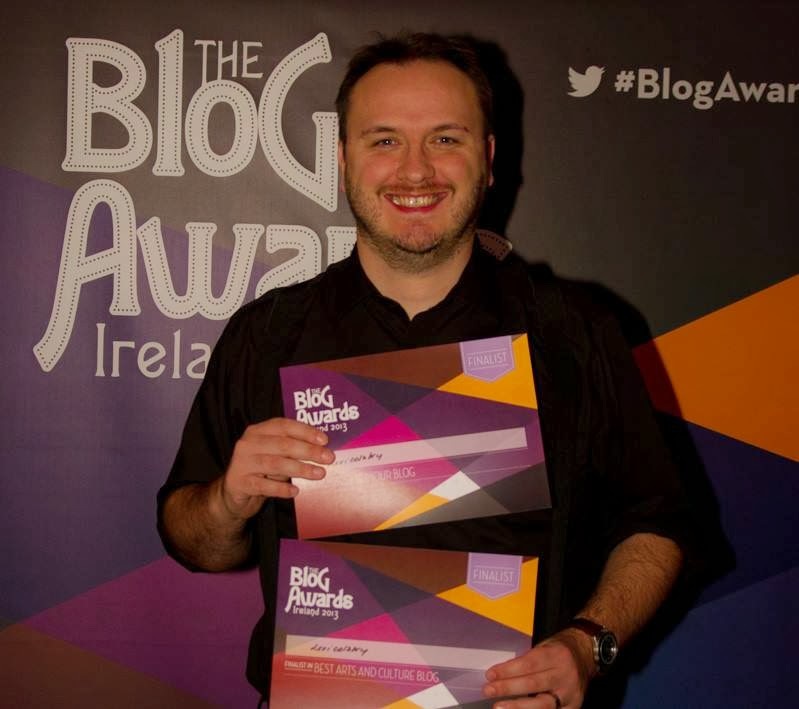 I invest a whole year's work into Lexicolatry, and then she - the woman who only discovered what blog means on the drive up to Dublin - she then swans into the ceremony and scoops a prize, while I just sit there empty-handed. Truly, this is an unjust world, and I am resolutely and determinedly bitter about it. There were some positives to the evening, however. We shared our table with some ridiculously cool people (cool bloggers - who'd have thought? ), including Alex and Becky from Pink Elephant Bloggin, Marta from Addicted to Fashion Forever, Ali from CrafTea and Wendy from My Chef at Home. Also, there was lots of wine, goody bags and an enormous screen that displayed everyone's tweets so that, while I didn't get to see my name on any trophies, I did get to see it next to a string of increasingly bitter tweets that I could broadcast to the whole room. That was fun. 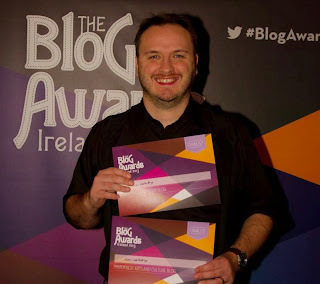 I have to say, as someone that had never previously met another blogger, it was an amazing experience, and I would definitely be interested in further blogger meetups. My only advice is not to take along a spouse that will upstage you on the night. Nor one that will keep going on about it after. And will phone all your family and friends to tell them about it. That's my only advice. 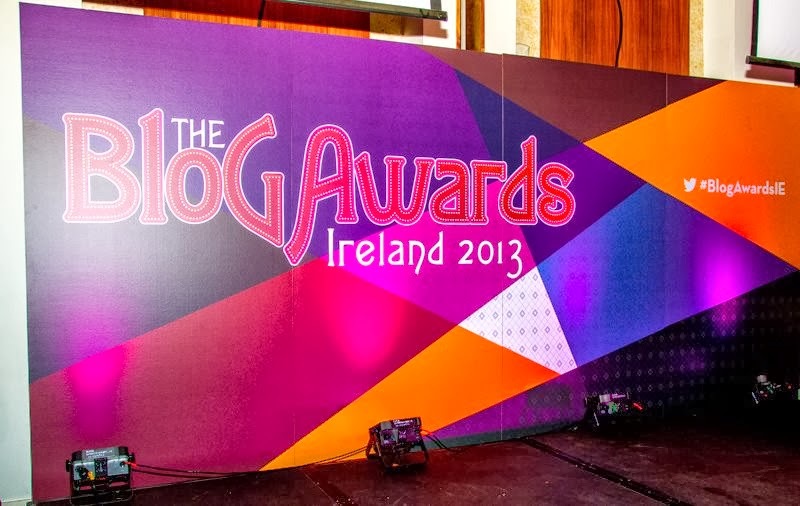 If you'd like to see more pictures, you can do so by having a look at the Blog Awards Ireland Facebook page. Oh, faithful readers of Lexi: don't forget not to check out The Irish Aesthete, At the Clothesline or With All the Finesse of a Badger as they are now my mortal blogging enemies. That's all I ask. Thank you. Oh Mrs Lexi this and Mrs Lexi that - she's had quite enough congratulations, thank-you-very-much, Evi! Yes, congratulations to your wonderful wife! She does have bragging rights you know!! Either everybody in the first picture is very short, or you are very tall! You did very well getting to the finals Ed. Thank you, Jingles - and yes, I am freakishly tall. I forget, actually, until I see a picture of myself next to someone. Well done ed and ed-wife. C - you're back! How was your holiday? Did you feel the quake? And thank you - it was a really fun night.